In 2010, the German Federal Government launched one of its largest research initiatives in the area of logistics and supply chain management with the central aim to secure tomorrow’s individuality, in the sense of mobility and distribution, with 75% of today’s resources. One of the projects, the ‘Competitiveness Monitor’ (CoMo) develops an innovative, webbased foresight platform, which supports strategic decision-making and contingency planning as well as competitive and environmental intelligence. The development of an innovative Trend Database (TDB) is part of an extensive cluster initiative that was launched by the German Federal Ministry of Education and Research in June 2010. The ‘Effizienz­Cluster LogistikRuhr’, synonym for leading-edge cluster in logistics and mobility in the German Ruhr area, aims to boost innovation and economic growth in Germany by bridging the gap between science and industry (BMBF 2010). The cluster involves 130 companies and research institutes that cooperate in a strategic partnership in order to shape a sustainable future for the region and beyond. The determined challenges of future logistics (e.g., urban supply) are currently being addressed in more than 30 joint research projects. In this way, the cluster contributes to finding new ways to growth and employment that gear not only Germany’s but the European Union’s economy towards greater sustainability (see, e.g., Schütte 2010). One of the joint research projects is developing an innovative foresight tool, the Competitiveness Monitor (CoMo), which will contribute to the validity and robustness of foresight activities by digitally combining quantitative and qualitative forecasting methods. The CoMo aims to enhance cooperation in multi-stakeholder environments through a fully integrated web-based software solution that utilises existing knowledge and users’ conceptions. The tool links several applications for forward-looking activities as well as the development, processing and storage of foresight knowledge. The goal is to provide decision-makers from business, academia and government institutions with a valid knowledge base for future-robust decision-making. 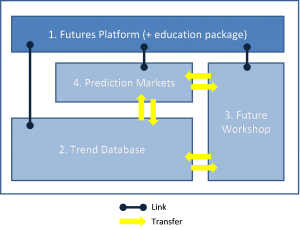 The CoMo consists of three innovative foresight tools – Trend Database, Prediction Market app and a Future Workshop (“Zukunftswerkstatt”) app – which are implemented in an IT-based Futures Platform (Figure 1). The Futures Platform will serve as login portal in form of a dashboard and can be adapted by each user according to his or her individual interest. Within the TDB, future-oriented numbers, data, and facts on specific logistics-related topics or technologies can be stored or collaboratively developed by its users. Furthermore, the TDB shall not only include trend-related data but also handle weak signals, wildcards and disruptive events. The high practicability of the Trend Database is planned to ensure filtering of the query results through an intelligent algorithm. In the beginning of the TDB development process, we analysed and evaluated eight relevant TDBs in order to identify the state of the art. After that, we conducted several creative workshops and interviews with more than 40 interdisciplinary cluster partners and futures researchers to identify further requirements. In the next step of the TDB development process, we conducted a stakeholder analysis in order to generate possible use cases. Different use cases were defined according to the specific needs and organisational structures of the CoMo project partners and members of the EffizienzCluster involved. In doing so, we were able to conceptually test and complement the identi-fied requirements and constraints. Finally, we revised the results of the trend database analysis and specification analysis and summarised our research results in a specification sheet, which now provides a clear and structured collection of TDB features for the programming process of a prototype. For the identification of the key challenges, we evaluated best practices and innovative features of existing TDB concepts regarding their applicability and efficiency. For this purpose, we focused on the surrounding conditions and primary objectives of the presented TDB, determined by its purpose within the CoMo and the cross-project objectives of the leading-edge cluster. We identified four main challenges of utilising a TDB, which we will discuss in the following: (1) extent and quality of trend information, (2) cooperation within the TDB community, (3) linking mechanisms and (4) creating incentives for users. Most of the TDBs analysed provide an extensive set of opportunities to describe and evaluate a certain trend or future signal. Since it is hardly possible to decide without further knowledge about the user’s purpose or what the right amount of information is, we continued to compare the ways in which future knowledge is contributed to the TDB. We see two main strategies within the examined sample of TDBs: (1) input from experts and futures researchers or (2) active participation of the user community. In the latter strategy, information is revised and complemented by the community, which more accurately meets the CoMo objectives of realising cluster potentials. However, in case of low interest in a certain trend, the information may remain fragmentary and lack reliability. The combination of both strategies seems to be promising since it ensures certain quality standards as the information provided is subject to scrutiny from two sides: an expert review process, on the one hand, and user participation, on the other. 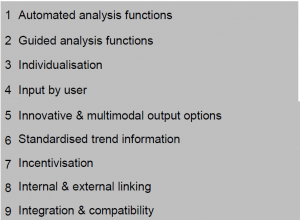 Against the background of all our analyses, we propose that providing a certain amount of trend specifications (e.g., short description, key words, time horizon etc.) should be obligatory when entering a trend into the TDB. In addition, the CoMo TDB is planned to offer a regulator for the ‘level of aggregation’, which will enable users to constrain the trend search results regarding time, geography, economic scale and further aspects. The so-called “wisdom of the crowds” is based on the logic that many people (a “crowd”) know more than single individuals (Surowiecki 2004). Consequently, the sharing of knowledge can improve the knowledge basis of different stakeholders as well. Therefore, it is useful – particularly in dealing with future-relevant knowledge – to motivate users to co-operate and to develop their knowledge further. Regarding our TDB architecture, users shall therefore evaluate trends in terms of impact or likelihood, participate in surveys or add further evidence or aspects to existing future-oriented knowledge (Kane and Fichman 2009). Especially the stakeholders of the leading-edge cluster, who are aiming to improve their competitive situation through collaboration, are interested in sustaining topicality, validity and relevance of future-relevant knowledge in the trend database. Our TDB is expected to contribute to an improved quality of data and provide a more accurate basis for decision-making processes. The CoMo TDB will be linked in three dimensions. First, the trends within the TDB will be linked among each other. This supports users by providing a more comprehensive causal picture of the future and allows decision-makers to identify early warnings and weak signals. Second, the trend database is linked to two other CoMo apps: the Prediction Market and the Future Workshop. Both apps require raw data from the TDB for purposes of evaluation (i.e. prediction markets) or analysis (i.e. future workshops). Furthermore, they define data sources by providing new or evolved future-oriented knowledge, which needs to be re-imported into the TDB. Third, the trend database will be linked to external data pools. Facilitating the idea of linked data, relevant external information can be included, increasing the basis to be drawn on in making future-relevant decisions (Auer and Lehmann 2010). Thereby, we aim to link our dataset intelligently by attaching metadata using the Semantic Web approach. This not only facilitates the process of finding relevant and recent data but also enables identifying related topics. In contrast to the traditional World Wide Web, the application of a Semantic Web offers information that can be sorted by relevance, topicality and quality (Berners-Lee, Hendler et al. 2001). However, the Semantic Web requires the linkage of datasets first. Therefore, users have to be encouraged to tag, for instance, the trend information as good as possible, and the community needs to be motivated to edit and complete the tagging process. In the process of developing the CoMo TDB, we discussed several concepts and ideas to address the challenges involved in motivating users. One concept that is planned to be applied in the CoMo is the lead users approach (Leimeister, Huber et al. 2009) in which users are incentivized by an awareness of the measurability of their contributions. Considering that most of the existing trend databases use an expert-based concept instead, we infer that this was thought to be the only efficient way of providing and processing future-oriented knowledge so far. However, current tendencies, such as the disclosure of previously protected data (i.e. open source/innovation) or the increasing activity in social networks, suggest that existing concepts need to be adapted to the new requirements forward-looking activities must meet. Future-oriented knowledge as a basis for decision-making is always critical due to its inherent uncertainty. Therefore, innovative concepts and tools need to be developed in order to provide users with the most valid, relevant and up-to-date information possible. With our new TDB concept, we try to acknowledge current challenges such as motivation and collaboration of users, usability of information and modern linkage methods. To meet these challenges, we aim to link our dataset intelligently by attaching metadata using the Semantic Web approach. This not only facilitates finding relevant and recent data but also enables identifying related topics. However, the linkage of the data has to be conducted manually. Thus, motivating users to share their knowledge within the community is essential to provide an accurate and comprehensive picture of the future reflecting the wisdom of the crowd. Finally, we will design our TDB to present future-oriented knowledge in a sufficiently comprehensive and detailed manner with an emphasis on clarity and thereby aim to contribute significantly to the robustness and quality of future decisions. Auer, S. and J. Lehmann (2010). “Creating Knowledge out of Interlinked Data.” Semantic Web Journal 1. Berners-Lee, T., J. Hendler, et al. (2001). “The Semantic Web.” Scientific American 284(5): 34-43. BMBF (2010). Germany’s Leading-Edge Clusters. Division for New Innovation Support Instruments and Programmes. Berlin, Bonn, Bundesministerium für Bildung und Forschung / Federal Ministry of Education and Research (BMBF). Kane, G. and R. Fichman (2009). “The Shoemaker’s Children: Using Wikis for Information Systems Teaching, Research, and Publication.” Management Information Systems Quarterly 33(1): 1-22. Leimeister, J. M., M. J. Huber, et al. (2009). “Leveraging Crowdsourcing: Activation-Supporting Components for IT-Based Ideas Competition.” Journal of Management Information Systems 26(10): 187-224. Schütte, G. (2010). Speech by. Germany’s Leading-Edge Cluster Competition – A contribution to raising Europe’s profile as a prime location for innovation. State Secretary at the Federal Ministry of Education and Research framework of the European Cluster Conference. European Cluster Conference. Brussels. Surowiecki, J. (2004). The Wisdom of Crowds, Random House. Note: The content of this publication is based on the joint research project “Competitiveness Monitor”, funded by the German Federal Ministry of Education and Research (project reference number: 01IC10L18 A). Joint research project partners are Bayer MaterialScience, BrainNet, dilotec, EBS Business School. Responsibility for the content is with the author(s). The project Freight Vision Austria 2050 (FVA2050) aimed at providing a foresight study of freight transport and logistics futures in Austria by 2050. The intention was to explore the future of freight transport and logistics in particular, looking at technological progress and future innovation opportunities. A second aim was to outline a shared vision of an Austrian freight transport system by 2050 that would achieve European as well as national environmental and transport policy targets. The project FVA2050 was structured similarly to the European project FreightVision Europe (FVE 2050). FVA2050 was commissioned by the innovation section of the Austrian Ministry of Transport, Innovation and Technology. The objective was to set priorities and give a synopsis of key technologies and future innovation opportunities. Similar to economic growth, demand for freight transport in Europe is expected to double by 2050. As integration of the European internal market progresses and Europe represents one of the most competitive economic regions of the world, export industries all over Europe are expected to grow. This will particularly concern small, export-oriented national economies at the centre of Europe, such as Austria, which are strongly affected by freight transportation. Experts estimate that freight transport will increase across all transport modes. Rising pressure on infrastructure capacity, an increasing environmental burden and upcoming conflicts over failing to achieve CO2 emission and noise reduction targets are likely. However, from a regional perspective, increase in transport demand might not affect the overall transport network in Austria apart from the main traffic axes. FVA2050 was informed by the general vision of the European Commission for a most competitive and sustainable transport system in Europe. This includes “growing transport and supporting mobility while reaching the 60% CO2 reduction target” (European Commission 2011, p.5). However, priorities from a regional perspective may differ from those defined at the European level. Other environmental policy targets, such as particulate matter or noise and vibration reduction, can be considered equally important. Most freight transport in ton/kilometres is regional and not long distance freight transport. From a regional perspective, future scenarios revolving around reregionalisation are thus more feasible than scenarios based on internal market integration and globalisation. From a regional point of view, traffic congestion is a problem of infrastructure bottlenecks and not of the overall European transport network. The main challenge here is to coordinate environmental and transport-related policy targets across different policy levels and policy areas. The FVA 2050 project pursued an expert-driven, forwardlooking approach. Stakeholders and experts from different areas relevant to freight transport in Austria participated. Among them, in particular, demand-side actors from transport and logistics companies, but also researchers, NGOs and public administration representatives at the national and the state level (Länder). The aim of FVA 2050 was to explore possible futures of freight transport and logistics in Austria up to 2050. The participating stakeholders and experts outlined a shared vision and, in the process, blueprinted structural change in the freight transportation system to achieve the European CO2 emission targets and other transport and environmental policy objectives, such as minimising road fatalities, abating noise and particulate matter pollution and reducing congestion. Ideas and opinions on how to transform the current freight transport system towards this vision were discussed in detail, particularly ideas concerning technology and innovation pathways towards the future. In the second foresight forum, the participants identified relevant technology and innovation pathways towards the future from a present point of view and perspective. They assessed options and obstacles of technological progress from the present to the future and opportunities for future innovations, considering the socio-technical context embedding and the socio-economic conditions shaping them. The final task of the second foresight workshop was to sketch out a shared vision of a structurally changed freight transport system for Austria that would allow to attain the different policy targets by 2050. The third foresight workshop was dedicated to further specifying the vision of a structurally changed freight transport system by 2050, including the main actions necessary to achieve it. However, in the end, the focus was mainly on technological steps towards this vision. The main mission of FVA 2050 was to identify relevant priorities for the upcoming process of setting the national technology research agenda for research and innovation funding. A final, rather normative exercise allowed to define more radical technological steps. 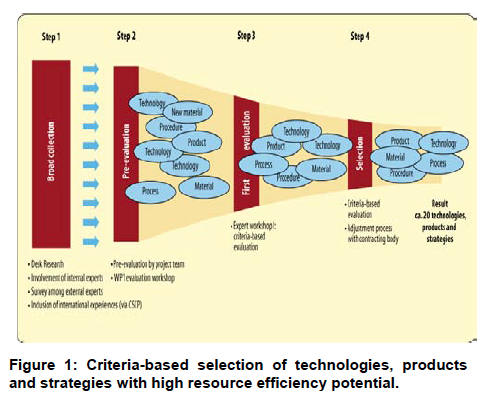 The incremental key technology and innovation opportunities initially identified by an explorative method were thus complemented by a range of blue-sky and out-of-the-box technology and far horizon innovation opportunities. The foresight exercise created a vision for a structurally changed Austrian freight transport system by 2050 and drafted a range of socio-economic framework scenarios. Finally, the major outcomes were a synopsis and a prospective assessment of key technologies and future innovation opportunities up to 2050 and beyond. Around 80 experts and stakeholders of the Austrian freight transport system participated in FVA 2050, an average of 30 participants in each workshop. The foresight was implemented by a consortium of six partners: the AIT Departments Foresight & Policy Development and Mobility, the Department of Logistics at the University of Applied Sciences in Upper Austria and the Department of Production Logistics Management at the University of Economics and Business in Vienna. ProgTrans AG from Switzerland delivered a transport demand outlook for 2050. Transver Gmbh delivered an environmental impact assessment referring to the transport demand trends of ProgTrans AG. Most partners had already been involved in the European funded foresight FreightVision Europe (2007–2009). They were thus invited to propose a similar forwardlooking and foresight activity for Freight Transport and Logistics 2050 and beyond in Austria. The Ministry of Transport, Innovation and Technology (bmvit), the two major Austrian funding agencies (FFG, AWS) and the two major national rail and road infrastructure operators (OEBB, ASFINAG) assisted the foresight. They were all involved in an advisory board. The foresight study Freight Vision Austria 2050 was performed during three large stakeholder workshops. Most of the stakeholders participated in all three workshops, which gave the exercise a particular continuity. Prior to each workshop a discussion paper was drafted by the consortium members and distributed among the participants. This discussion paper was based on desk analyses and outcomes of the preceding workshops. The future dialogue started with an intensive discussion of the transport demand outlook presented at the first workshop. The prognosis anticipated a doubling of freight transport demand by 2050. This growth in freight transport demand can be expected to lead to a relevant increase in transport activities across all transport modes. An increasing shift to rail transport and even a bigger increase in road transport is estimated. Inland waterway transport is expected to remain at moderate levels due to exterior infrastructure. The transport demand outlook and the projections of freight transport activities by 2050 were discussed controversially. On the one hand, the experts agreed that a significant increase in transport could be expected to come with economic growth. On the other hand, the experts questioned the anticipated doubling of trans-European freight transport, pointing out that a return to a regionalisation of production networks and supply chains could change the trend. However, the outlook gave definite alert that freight transport is expected to increase until 2050. Particularly on the main axes, transport infrastructure capacities in Austria may not at all be prepared to accommodate such growth. 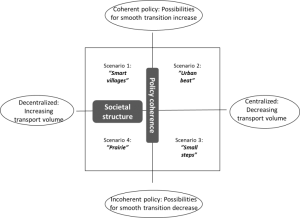 The rather controversial discussion in the beginning motivated the preparation of four distinct socio-economic framework scenarios. At first, storylines were developed and elaborated into coherent stories of potential socioeconomic futures. In a second step, the scenarios were discussed regarding their overall feasibility. For example, the scenario on growth and liberalisation was assessed as less feasible than initially expected. The experts did not perceive it to be an option to leave freight transport futures to liberal markets alone; regulation and public policy were considered just as necessary to cope with increasing freight transport demand. Thus the second trend scenario on growth and regulation was seen as more feasible than the first scenario of full market liberalisation. The experts anticipated a future of European freight transport where the primacy of the “free movement of goods” should no longer be interpreted as free choice among all means of transport along all European transport infrastructure axes. The Zurich Process for cross-alpine freight transport (CAFT) – a cooperation between the transport ministers of the alpine member states – was an example mentioned in this context. The experts pointed out that they explicitly expect a trans-European initiative to push the road to rail shift in the future. Even more interesting was the dialogue regarding the two trend-breaking scenarios. The first of these socioeconomic scenarios was rather similar to trend break scenarios in other transport-related foresight exercises. None of the experts rated an oil price increase as a shock event but as a moderate driver towards technological alternatives such as the electrification of road transport or alternatively fuelled vehicles. Another discussion focussed on a return of regionalisation and local production networks. Instead of more European market integration, the shrinking of the internal market was seen as a potential socioeconomic future triggered by increasing global protectionism and global economic conflicts. 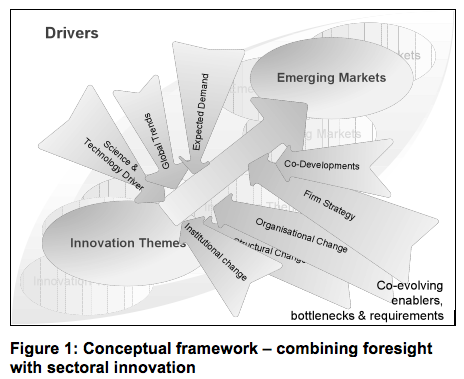 By comparison, in 2009, such a socio-economic framework had not at all been envisioned in FreightVision Europe 2050. In the second foresight workshop, the discussion focussed on relevant environmental and transport policy targets for freight transport futures. It was difficult to come to a conclusion. Although there are strong trends toward harmonising environmental and transport policy targets in the European multilevel governance system, there is obviously still an open debate whether these objectives ought to be seen as a planning horizon or as guidelines for the future. Policy targets at one policy level may conflict with policy targets at other levels. The involved stakeholder and expert group decided to take European policy targets in addition to national targets as a frame of reference while addressing this frame in a rather general way based on a shared vision of how to shape the Austrian freight transport system by 2050 (structural change) by taking into account an increase in freight transport demand by 30-40% by that time. As the core of this foresight process, a shared vision of the Austrian freight transport system in 2050 was blueprinted. The participants illustrated their ideas and visions in a group exercise and further discussed their ideas and expectations for the future. All illustrations were integrated in a single shared vision scenario. A European transport network will be achieved by 2050. European legislation will serve to drive and harmonise environmental and transport regulations. However, a single European transport network is expected to be achieved as a network of networks with a European main axes infrastructure network at its core, but tightly connected with inter-regional, regional and urban mobility networks. Communication and information technologies will progress and allow to more closely connect these networks while allowing for many alternative mobility patterns for travelling and transporting goods. In a far-distant perspective, private sector mobility and transport might decline since European industries can be expected to more strongly revolve around knowledge-based services. In 2050, freight transport at medium (up to 300 km) and long distance (above 300 km) will be fully intermodal, with a considerable shift to rail transport. European infrastructure axes for all transport modes will be integrated into one single corridor network. Road transport (below 300 km) will be widely electrified with large numbers of charging stations providing the necessary infrastructure. However, electrification of road transport may not be feasible for heavy duty transport. Last-mile transport will still be mainly road-based and rely on individual transport modes. Automated systems and pipe networks are expected to be deployed in urban areas. Logistics in 2050 will be organised rather centrally under strict rules and requirements set at the European level. Third parties are going to organise logistics in crossregional or regional and urban distribution networks. Large interregional distribution centres will be established on a European scale. Tri- and bimodal hubs will be situated along the main transport corridors near manufacturing sites and will profit from information and communication concentration and renewable energy clusters (smart grids). Significantly improved freight demand management will reduce empty and half-full trips; this will include alternative modes of operation, for instance so-called milk runs for circular distribution. In these areas, particular technology and innovation pathways were assessed. Communication and information technologies as well as alternative vehicles and new materials were introduced as enabling technologies. From 2020 to 2035, supply and transport chains will be further “smartened” by ICT. Information management systems will enable systems that calculate ecological impact. Between 2035 and 2050, most infrastructure and freight vehicles will be equipped with communication modules enabling real-time multimodal transport information. Autonomous and semi-autonomous vehicle systems are expected to increase capacity and safety by platooning. A similar revolution like the container will provide new opportunities for intermodal transport with swap bodies to serve the European internal market. Automated harbour and hinterland transport, including vertical and horizontal loading systems, is expected to allow 24-hour operation. A European transport network will include a Europe-wide network of intermodal transport hubs. Transport infrastructure will be connected to energy infrastructure as a smart mobility/energy grid. In a distant perspective, from 2035, distributive intelligence in command and control will give rise to decentralised robot systems: smart objects, pipe networks and other simple track systems. One of the key questions raised in FVA 2050 was if electrification of road freight transport might also be viable at medium and long distances in the future – a measure that is thought to play a significant role in achieving future European CO2 emission reduction targets. Experts believe that a shift to rail freight transport for distances above 300 km and even below 300 km for regional distribution will be a significant option in the long term. However, additional measures are required, for instance, regional rail/road distribution centres serving the first and last mile by an electric fleet. This has direct implications for future mobility and transport as well as transport-related technology and innovation policies. Download the brief: EFP Brief No. 231_FreightVision Austria 2050. The project goal was to develop a long-term vision and action plan for a sustainable European long-distance freight transport system by 2050, covering both transport policy and research and technology development policy. It aimed at bringing new knowledge (e.g. on climate change), perspectives (including from outside the transport sector) and stakeholder groups into an established field. Creating channels for communication between participants from business, policy, civil society and R&D to overcome sectoral boundaries was an explicit goal from the beginning. The European Union faces the challenge to ensure economic growth and cope with limited transport infrastructure as well as increasing demand for freight transport in the years and decades to come. At the same time the transport system is supposed to become sustainable with a decreasing impact on climate change. The Freightvision foresight focuses on a subset of sustainability aspects that are currently considered the most critical ones with regard to a sustainable European transport system and have failed to meet sustainability standards so far. These aspects are greenhouse gas (GHG) emissions, the share of fossil fuels, road fatalities and traffic congestion. They have been addressed specifically in the mid-term review of the European Commission’s 2001 transport white paper. The Commission’s 20-20-20 goal to reduce GHGs and fossil fuel consumption and increase the share of renewable energy sources by 2020 along with the longer-term goal to reduce GHG emissions to 80% of the 2005 baseline by 2050 are tremendous challenges for the transport sector and particularly for freight transport. DG TREN (MOVE) reacted to the overall goal and elaborated a new white paper. The financial crises and the rapid rise in energy prices led to new perspectives. Forecasts used before were outdated and business as usual scenarios had to be reconsidered. The foresight focussed on long-distance freight transport in three modes: road, rail and inland waterways. The time horizon was set to 2050 in order to take into account climate change mitigation goals and the life cycle of infrastructures. Sustainable development should be envisaged in terms of GHG/CO2 reduction, reduction of fossil fuel use, less congestion and traffic accidents (particularly on roads). 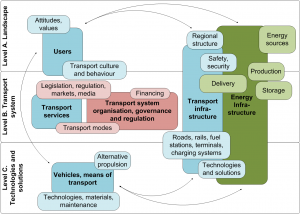 The aim to develop a vision of long-distance freight transport in 2050 was understood in two different ways: (a) in the sense of concrete targets for 2020, 2035 and 2050 and (b) as a visualisation of the future of sustainable freight transport in 2050 based on stakeholders’ expectations. The tangible output of the project was to consist of an action plan with recommendations for transport policy as well as for research, technology and innovation policy. The Freightvision foresight was designed as a complementary foresight process. The process accompanied the whole project and assured that stakeholders’ expertise and perspectives were integrated into the support action. The complementary approach genuinely combined methodology, role and task sharing to capitalise on the capabilities of transdisciplinary research, foresight expert advisory and (trans-) organisational development counselling for complex projects settings. Transdisciplinary research: Expert knowledge about the transport sector as well as the socio-economic and policy issues involved here. In particular, climate-related adaptation and mitigation expertise was brought into the stakeholder fora. Foresight methods and techniques: Designing tailor-made foresight processes that encompass a fully fledged foresight process with appropriate techniques for the exploratory and normative phases. 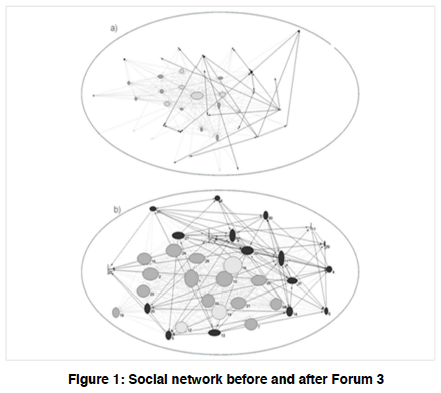 (Trans-)Organisational development (OD) counselling: Orchestrating knowledge flows and network building in large group settings, such as the fora. 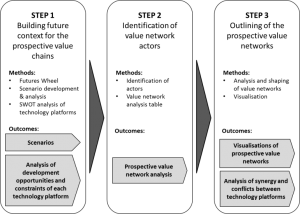 In Freightvision, results from several quantitative models were fed into the participatory foresight processes. The results of energy models informed the oil price scenarios; a congestion model and a CO2 emission model were used to analyse the impacts of reduction scenarios and assess policy measures. Because the project provided a strong quantitative evidence base and integrated different strands of evidence by involving practitioners and including scientific expertise, deliberative participation and learning in large group settings led to well-founded results. Stakeholder participation in this case was defined as invited representatives from research, business, policy and civil society taking part in a strategic dialogue on long-term issues. The stakeholders were explicitly involved as ‘experts’ based on their practical knowledge. The expertise of participants was treated as deliberative input to shape the content and tangible results of the foresight process, leading to robust scenarios, recommended action plans, visions and background reports. To accentuate the expert role, attendance was mainly by personal invitation. The foresight process involved more than 100 representatives from the EC, ministries of the member states, advisory councils, technology platforms & ERANETs, freight forwarders and logistics companies, infrastructure operators, industry, trade, cargo owners, vehicle technology and energy suppliers, environmental and other non-governmental organisations (NGOs) as well as trade unions. The project intended to take a holistic approach that addressed all aspects of the future challenges, i.e. infrastructure, ITS, propulsion systems, vehicles, fuels, interoperability etc., and considered all types of criteria in the solution: research, technologies, policies and pricing. The invitations were issued so as to ensure that a balanced mix of participants represented all relevant areas and that no group of stakeholders or mode of transport was over- or underrepresented. The Freightvision process was organised in four highly interactive stakeholder expert meetings (fora) with up to 90 participants in each one. Given the large group settings, the goal of encouraging deliberation and the network-building function of the fora, the foresight relied on an overall architecture that had to be tailored to purpose. The methods applied in the group process were borrowed from the field of organisational development (OD) research, which focuses particularly on changes in the thinking and action of stakeholders. Applying OD concepts and instruments throughout all phases of the foresight aimed to maximise interaction, collaboration, deliberation and learning among stakeholders. The four fora took place during a 12-month period from 2009 to 2010. They were designed around participative sessions where a maximum of 10 participants were seated at a table and each table discussed specific questions under the auspices of trained moderators. The stakeholders discussed project results, refined, adjusted, integrated and assessed the work of the project consortium, and collectively developed scenarios, visions and an action plan. Long-term development of energy prices were taken from the Primes and PROMETHEUS model. Forecasts from the Progtrans European Transport report were used to predict transport demand. The TRANS-TOOL model was used for a congestion trend forecast for 2035. Making certain assumptions for the shorter term, the model was not flexible enough to properly capture longer-term developments as it was restricted to a limited network infrastructure of roads and railways. A model for long-distance freight transport emissions and energy consumption was developed by the Finnish partner, SYKE. The model helped estimate the emissions and energy consumption of future transport systems described in the business-as-usual forecast and the backcasting exercise. The model maintained flexibility in accounting for different combinations of vehicles, technologies and fuels. The model results – although often described as “forecasts” – were never used in the sense of predictions since such forecasts are most likely to be wrong. Instead, the results were used as a basis for discussions and a means of becoming clear about dimensions and relations (e.g. the emission reduction potential of transport modes). Awareness was raised that while model assumptions have to be made explicit, they are necessary to come to a manageable amount of scenarios in the process. 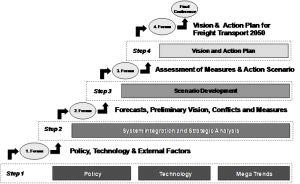 The projects led to a fully fledged foresight process including methods and techniques such as desk research, modelling, visioning workshop, scenario development, backcasting, wild card analysis and impact assessment. 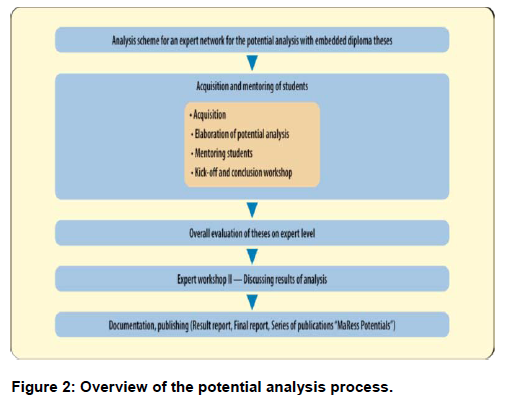 Figure 1 illustrates how the methodologies and particularly how modelling was integrated into the foresight process. Modelling was a part of each step of the project. The foresight forum meetings took place after each project step, and the modelling results and other findings were used and discussed in the fora. Apart from publishing research results in detailed work package reports, more comprehensive briefing documents (management summaries) were sent out to the participants prior to the fora to make knowledge flows more effective and transparent. The process resulted in three stylised projections for each of the four sustainability criteria GHG emissions, the share of fossil fuels, congestion and accidents by 2050. The project proposes a long-term vision and a robust and adaptive action plan, developed in a joint effort by the project team and relevant stakeholders, for both transport and technology policy for sustainable long-distance freight transport in Europe. Reaching the GHG reduction targets when taken seriously will have a tremendous impact on freight transport. It became clear that the EC goals for reducing GHGs will be the most important driver of freight transport policy over the coming decades and can be expected to dominate other EU-level transport policy issues, such as congestion and accidents. Containing GHGs from road transport will require the most efforts in the process. The modelling exercise showed that, even if volume could be doubled and electricity is produced by low carbon sources, rail freight transport would only contribute to reduction targets to a rather small extent. Quantifiable targets for the sustainability criteria (Tab. 1) were formulated in correspondence with the models where available. Targets were set for GHG emissions, the share of fossil fuels, congestion and accidents. Preliminary targets were assessed based on the action scenario (developed in a backcasting exercise), a conflict and feasibility analysis and a wild card analysis. A modal shift from road to rail would have a limited effect only. The relative importance and potential remedy of shifting freight from road to rail transport was heavily discussed. Quantitative modelling showed low potential for increasing the currently relative small portion of rail traffic substantially. Gigaliners, praised by some as highly efficient, can play only a small role in reducing GHG emissions effectively. Road transport is the main producer of GHG emissions and demands substantial action. Improved aerodynamics of trucks was identified as a very effective technological measure although existing norms hinder the dissemination of such improvements in road transport. More efficient logistics has to contribute 25% to GHG reduction if targets are to be met. Electrification of long-distance road transport would be necessary to reach the required reduction targets, which is a very challenging task in the light of the present absence of appropriate technologies, particular in storing non-fossil energy for trucks. Given the challenging but feasible reduction targets for GHGs, all of the above-mentioned policy actions would have to be implemented within a four-decade time span. Obviously, this has a number of critical implications both in terms of single actions as well from a systemic perspective. The advantage of a large group in a foresight process is the involvement of a broad range of policymakers and stakeholders, who are key players in shaping the future. To reach a shared vision for the future is probably the most critical factor for a transition to take place. Participation of key players increases the potential to reach consensus and form new networks or link existing ones to face new challenges. At the same time, working in large groups increases dissent. Necessary changes might threaten established positions and networks. However, carefully planning each forum can limit the threat of conflicts that might undermine the success of the foresight process. In Freightvision, controversies between stakeholders and within the Commission went beyond what would be expected for a FP7 project that has no direct influence on formal stakeholder consultation processes. Some stakeholders of the rail mode were particularly critical as the role of rail transport in reducing GHGs turned out to be less important than expected. However, the detailed process design, its transparency and the clear communication of the results of the qualitative and quantitative research helped to keep controversies at a constructive level during the project. Download: EFP Brief No. 226_Freightvision. Helmreich, Stephan; Keller, Hartmut (Eds.) (2011): FREIGHTVISION – Sustainable European Freight Transport 2050, Fore­­cast, Vision and Policy Recommendation. Springer Verlag, Berlin-Heidelberg. Helmreich, S., Kubeczko, K., Wilhelmer, D. and Düh, J. (2011): Foresight Process. In Helmreich, S., Keller, H. (Eds), FREIGHTVISION – Sustainable European Freight Transport 2050, Springer Verlag, Berlin-Heidelberg, 17-32. Schartinger, D., Holste, D., Wilhelmer, D. and Kubeczko, K. (2012): Assessing immediate learning impacts of large foresight processes. Special Issue: Foresight impact from around the world, Foresight 14(1), 41-55.